The sugar industry accounts for 0.5% of national GDP. Sugarcane fields cover 670,000 hectares (1.6 million acres) in Mexico, the second largest crop area after corn. Yields of sugarcane range from 60-70 metric tons/hectare. The main cane producing states are: Veracruz (1.9 million metric tons), San Luis Potosí and Jalisco (each 0.6 million), Oaxaca and Chiapas (each 0.3 million), and Nayarit, Tamaulipas and Morelos (each 0.2 million). Veracruz is the leading state by far in terms of area of sugarcane fields, with 260,000 hectares devoted to cane, folled by Jalisco, San Luis Potosí and Oaxaca (each with around 56,000 ha) and Tamaulipas (43,000 ha). ﻿Sugarcane fields and their associated sugar mills form a highly distinctive landscape in many parts of Mexico, with the greatest concentrations on the coastal plains on the Gulf and Pacific coasts, together with numerous higher-altitude river valleys in central Mexico. Sugarcane was brought to Mexico by Spanish settlers. Many major plantations were established, as they were in the Caribbean and Brazil. Mexico’s indigenous population provided a resident labor force, augmented by the introduction of some slaves from Africa (see Blacks outnumbered Spaniards in Mexico until after 1810). The large colonial sugar haciendas in Mexico (and some were very, very large indeed) exerted considerable influence over politics and local economies. Sugarcane remained an important crop following the Mexican Revolution (1910 onwards) which led to rural reorganization and much stricter controls on the size of land holdings. Sugarcane is grown on 150,000 farms, making their average size small, under 4.5 hectares (11 acres) each. This is partly a consequence of the Mexican Revolution which limited maximum farm size. About half of all sugarcane production units are 2 hectares or less in area. The small average size of sugarcane farms places severe restrictions on possible investments and effectively prevents any economies of scale. The annual harvesting of sugarcane in Mexico runs from late October to June. During the 2010-2011 harvest, 670,000 hectares of cane fields were cut yielding 44 million metric tons of cane, from which 5.2 million metric tons of sugar was extracted, 7.4% more than for the 2009-2010 harvest. More than 50 sugar mills currently operate in Mexico. The mills vary greatly in size, age and technology. Many are small, old and inefficient, which increases the cost of sugar production in Mexico compared to countries with newer methods and equipment. Mexico’s sugar mills have weathered numerous financial crises. In 2001, 27 mills were placed under government control, with about half of these mills later sold back to private ownership. In 2005, a revised Sugarcane Law guaranteed a basic reference price for growers, improving their financial security. 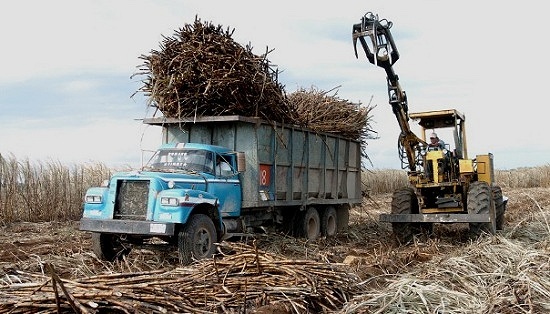 Almost half of all Mexico’s sugar mills are located in Veracruz state. The remaining sugar mills are scattered among an additional 15 states. Mexico’s domestic market consumes around 4.5 million metric tons a year, with the largest demand coming from the soft drinks industry. Consumption is expected to fall this year, due to reduced consumer purchasing power and escalating domestic prices for sugar fueled by speculation and supply shortages. Mexico is the world’s 6th largest exporter of sugarcane, and the main supplier of sugar to the USA. For the 2010-2011 season, sugar exports to the USA totaled a record 1.3 million metric tons. This figure has been increasing rapidly in recent years, partly due to sugarcane’s inclusion under the terms of NAFTA. Despite its exports, Mexico also imports small quantities of sugar, mainly from Nicaragua in order to maintain its own sugar reserves of around 1 million tons. winter frosts in some mountain areas, especially in the more northerly growing regions. much of Mexico’s cane is still hand-cut, and burning the cane fields prior to harvest is still a common practice, since it makes harvesting easier and drives out snakes. However, it has an adverse effect on air quality as well as on soil nutrients, structure and microorganisms. Large volumes of water are used in growing and processing sugarcane. Much is wasted; some is returned to groundwater sources or streams heavily polluted. More recycling and water treatment plants are needed. Air pollution is also a problem with some mills still to fit modern emissions control devices. The safe disposal of processing waste (some of which has potential value for subsequent use in other industries) is also a continuing problem. Sugar mills produce a variety of waste materials, many of which are currently dumped. Not quite! As suggested in the article, the annual harvest of sugarcane in Mexico runs from late October to June. where in veracruz mx and how much $ is Hectares? How much is 1 hectares / acre? The sugar cane is grown on the tropical lowlands of the state. 1 hectare = 2.4 acres. [4.5 hectares = 10.8 acres, etc]. I don’t know of anything, but will keep my eyes and ears open in case I come across anything that might be of value to you.